I am a big fan of the show American Idol! It all started for me when I first saw David Archuleta on AI‘s Season 7 in 2008. Since then I have followed the show for the past few seasons. I will admit, I have not been moved by many Idols be they past or present, the way I have been by David Archuleta. For me, he is the best American Idol to come from the show. Still, I am looking forward to watching the show this week now that the new Top 24 contestants have been chosen. They will be performing their first songs, starting with the women on Tuesday evening, followed by the men on Wednesday. On the Thursday night Results Show we will learn which contestants did not make it to the next round. “Shop Around” was written by Bill ‘Smokey’ Robinson and Berry Gordy in 1960. It is about a mother giving her now-grown son advice on how to find a woman worthy of being a good girlfriend or wife. The original recorded version of the song had a strong blues influence and was released as a single in Detroit, Michigan. However, Berry Gordy decided to record a pop-friendly version that would be commercially viable outside of the Detroit area. One night, he had Robinson and a cast of other famous artists of the time record “Shop Around” for the Tamla (now Motown) record label. This group became know as ‘The Miracles’. It was their version of the song that became a major national hit. The original record label credits Bill “Smokey” Robinson as the writer and Berry Gordy as the producer. The single “Shop Around” is notable for being Motown’s first #1 hit on the Billboard Magazine R&B singles chart and the #2 hit on the Hot 100. “Shop Around” also reached #1 on Cash Box pop charts and is also noted for being the first million-selling record for The Miracles and The Motown Record Corporation. The song became a Grammy Hall of Fame inductee in 2006. The Miracles’ version of the song ranked at #495 on Rolling Stone’s list of The 500 Greatest Songs of All Time. 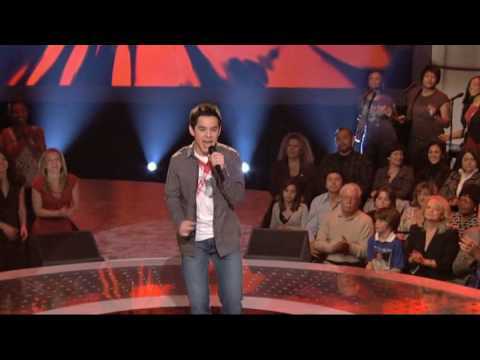 David’s version of “Shop Around” as performed on American Idol Season 7. February 19, 2008. This performance always makes me smile! My mama told me – you better shop around! whooaaa. My favorite ! thanks for the song info BigArchieFan.